There’s no way you’ll fail to see the Moby Niki when you reach the port. 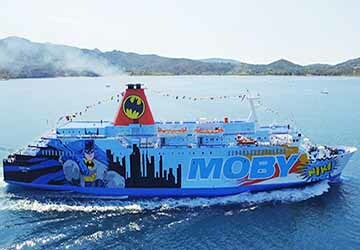 The vessel’s hull and superstructure are covered in Batman themed livery. This is the first to have this instead of the Looney Tunes decoration Moby customers would have become accustomed to. On board there’s room for 1440 passengers as well as 373 vehicles. There are amenities aplenty once you’ve set foot on this colourful ferry with a range of restaurant and food options, a shopping centre, children’s area, video games room and a sun deck. You can benefit from smartphone charging stations, Wi-Fi access and there’s even an on board kennel so your four legged friends don’t have to stay at home. There are no cabins due to the short distance the ship travels, however, there are comfortable reclining seats for you to enjoy. The seating lounge is also fitted with a large TV to watch as you sit back and relax. Passengers are treated to number of culinary delights with this Moby Lines service. The self service restaurant offers a range of dishes from local Mediterranean inspired dishes to ones with more of an international flavour. There is also a coffee shop, fast food outlet, patisserie, bar and even a Gelateria if you want to treat yourself to an ice cream. The Moby Niki has an on board shopping centre where you can buy all you holiday necessities, souvenirs and gifts. You can the shop has alcohol, tobacco, perfume, cosmetics, clothing, sportswear, toiletries, electronics, toys, books, magazines and much more on sale during your crossing. If taking in the sea vistas whilst catching some fresh air appeals to you then you’re in luck. The sun deck will allow you to relax and maybe even top up the tan en route to your destination. There’s no need to miss out on what’s going on in the outside world whilst you surf the waves. You’ll have access to Wi-Fi and also recharging stations for your smartphones on board. A specially designed children’s area and video games room will ensure the younger voyagers will have plenty to occupy themselves with during your crossing. Please Note: Whilst we have taken great care in making our Moby Niki guide as accurate as possible, onboard facilities, services and entertainment may vary depending on the date and time of year that you travel, facilities mentioned may change without notification and ferry companies reserve the right to operate vessels other than those mentioned at time of booking without prior notification.